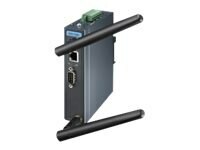 EKI-1361 are wireless serial device servers that bring RS-232/422/485 to wireless LAN or LAN. They allow nearly any device with serial ports to connect and share an WLAN network. EKI-1361 provides a quick, simple and cost-effective way to bring the advantages of remote management and data accessibility to thousands of devices that cannot connect to a network. With EKI-1361, your existing serial device can be used with the most popular operating systems on the market. There is no need to write special drivers for specific operating systems. Moreover, you can make serial devices communicate with other devices peer-to-peer, without any intermediate host PCs and software programming. That saves a lot of cost and effort. In addition, you can actively request data or issue commands from the RS-232/422/485 side or wireless LAN side. This data can be sent bilaterally. Thus, the EKI-1361 are especially suitable for remote monitoring environments such as security systems, factory automaton, SCADA, transportation and more.